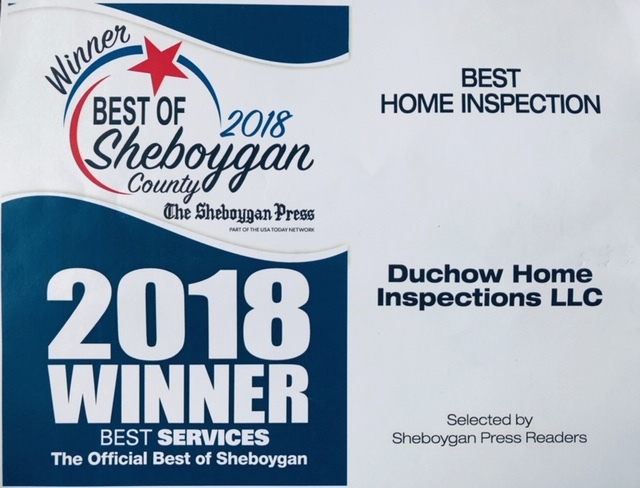 Duchow Home Inspections is dedicated to deliver a professional, objective and expert property and home inspection service by a trained, certified, and dedicated inspector. We are committed to exceeding our customer’s expectations in both quality and service in order to safeguard their financial investment. Accurate. Complete. Expert. Prompt. Duchow Home Inspections is all that for your peace of mind. A home inspection is one of the most important steps you will take when buying a home. Not only will it give you a sense of security, it will give you peace of mind. Peace of mind knowing that you have one of the best home inspection services working for you. When we say "you will find us on top", we mean it. Our inspection service will be there for you, before and after you have purchased your new home. Our main focus will be to make sure that the home we are inspecting for you is safe, everything is operational and all components installed in a professional manner. For the Home Buyer: Our home inspection is an analysis of potential fire hazards, home safety and health risks to you and your family. The inspection will provide you with a solid foundation of knowledge about your new home and an understanding of its components and systems, as well as home maintenance tips and information to help you protect your investment. For the Home Seller: Our home inspection offers you a great marketing advantage tool, giving you a competitive edge over other homes in your market. It will help you sell your home faster at the highest possible price. An inspection provides a full disclosure and gives the buyer peace of mind. It may also give you an opportunity to make any repairs to your home in advance, helping sell your home faster. "My husband and I recently bought our first home! With the many difficult decisions we made throughout this process, we must say that our home inspection was an "easy" part to it all. We were drawn to Scott Duchow by his friendliness. His honesty tells you of both the good and bad. The thoroughness of the inspection allowed for us to better understand what it is that Scott does best. Finally, we both found Scott Duchow to be trustworthy; which can be difficult to find! His service was worth every penny!" "We were not sure if we were going to have an inspection done when we were buying our first home. We are so happy we hired Duchow Home Inspections to do the job though. Scott was friendly and personable. He made us feel so comfortable. The knowledge he has for the business helped us decide to go ahead and purchase our first new home with confidence. Thanks so much Scott!" "It was a pleasure to meet you as well! I appreciate the work you did, the reports were accurate and finished in a timely manner, and thanks to you I was able to make a decision. Once again, thank you for your time and I hope to do business in the future." "I just wanted to Thank you for your services! I learned many new things and feel confident in our purchase. If anyone asks for a recommended Home Inspector, I will be pointing them in your direction! Thank you again -"
"As new home buyers, my fiancé and I had no idea what to look for when going through our new home, and we heard that it is hard to find a home inspector who will take the time to go through a home with a fine toothed comb and consider all of the unique intricacies that each home possess. Scott did just that. He spent a good two hours at the house, from inspecting the exterior and roof in the snow to jumping into the attic to crawling around in the basement and everything in between. Within 48 hours, I had a detailed, 30-some page report in my inbox outlining the house details and safety issues, along with great general information for how to maintain a home. Beyond doing a wonderful job inspecting the home and giving us detailed information, Scott was very personable and friendly, explaining what he was looking for and happily answering my questions. I will definitely use Duchow Home Inspections in the future and give Scott 5 out of 5 stars." "Everything was more than I expected and it was great meeting you as well! I will definitely be referring anyone who needs an inspection to you. Thanks again!